Custom Made to Measure Kids Kilt – 6-10 weeks Delivery. Browse the Tartan Database. When you select a Tartan you like, please write the full name of the Tartan as it appears in the database into the text box below. Please ensure you copy the entire code of the tartan to prevent a delay to your order (e.g. MacKenzie Dress). 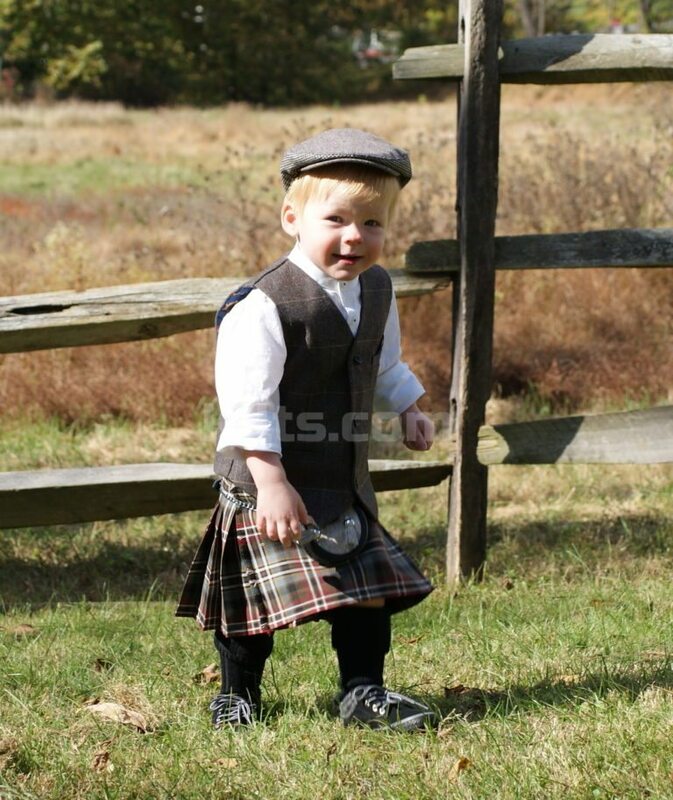 Our Kids Kilt is the perfect option for the little Highlander. 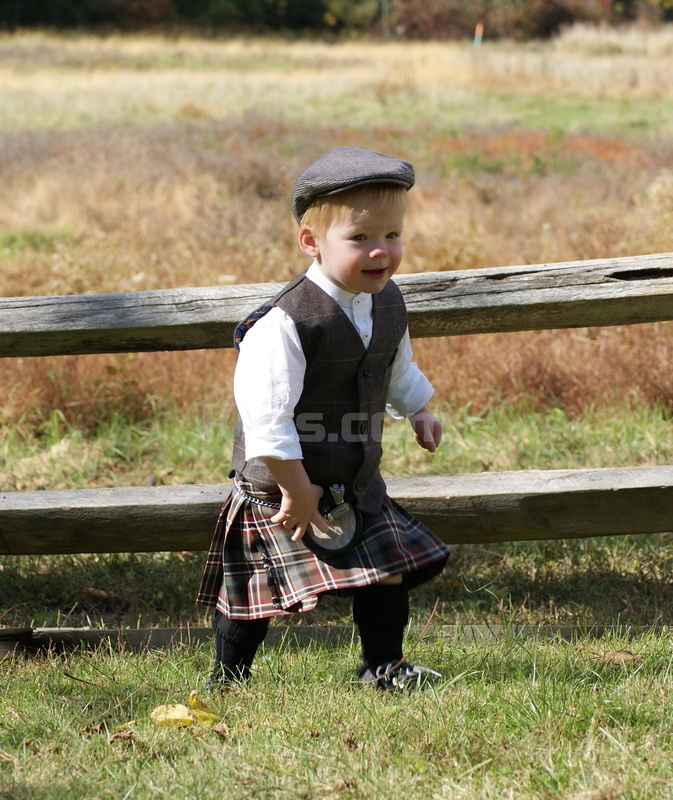 Our Children’s Kilts are ideal for weddings and other occasions. Our Kids Kilts are made with the same care and attention as our other kilts. This particular kilt resembles our Casual Kilt adult range, as the kilts are made of poly viscose fabric which is washable and stain resistant, which is what is required for a kids kilt outfit. For each kilt, we have added a 2″ hem which allows the kilt to be lengthened as your child grows. Each kilt is custom made to measure, and the kilt comes with a long piece of Velcro fitted at the waist which allows the kilt to be adjusted by several inches. Please ensure you browse the kilt measuring instructions before ordering. Unfortunately, no refunds are given if wrong measurements are provided. – Each kilt is made of 4-6 Yards of 12 oz. PV material , which is woven proudly in the UK. 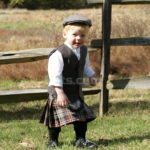 – The Children’s Kilt is available in over 100 tartans. – The kilt is coated in Teflon to make it stain resistant. – Makes use of Low Pill technology. – Can be washed in a washing machine. – The kids kilt is able to hold a high quality crisp pleat. The kilt is extremely easy to iron. – Made by a skilled kiltmaker to your child’s measurements that you provide. – Top Stitched (stitches visible on close inspection). – We use a “One thread margin of error” on lining up the pleats on all kilts sold through kilts.com. – Tapered down the fell. – Closure system made of Velcro. 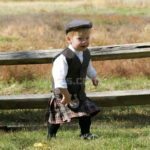 – 2″ hem which allows the kilt to be altered when your child grows.